In 1991, Clayman et al. reported the first laparoscopic nephroureterectomy (11). For the management of the distal ureter and bladder cuff, the authors described placing a 7 French ureteral catheter (5 mm diameter and 10 cm length) with an occlusion balloon cystoscopically under fluoroscopic guidance. The balloon was inflated with contrast material. Then, the bladder cuff was created transurethrally until 1 cm of ureteral tunnel was developed. The occlusion balloon prevents tumor seeding prior to the laparo-scopic nephroureterectomy. The ureter was laparoscopically dissected down to the detrusor muscle. 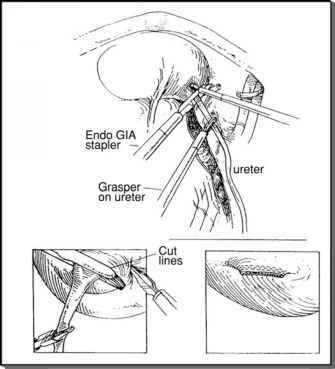 The ureter was retracted cranially and the bladder cuff was divided with a laparoscopic endoscopic gastrointestinal anastomosis (Endo-GIA) stapler (Fig. 1). The bladder was then tested for water-tightness. In a series of 25 patients at a mean follow-up of two years, the Washington University Group reported a 23% recurrence in the bladder and 15% in the retroperitoneum (12). One patient had urine leakage from the stapled line, which resolved with conservative management. 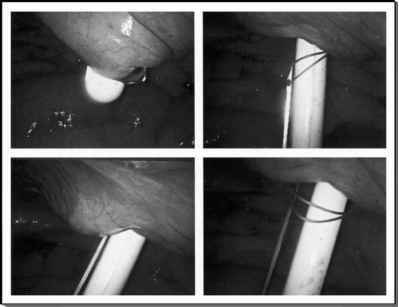 The advantage of this technique is that intraoperative urine extravasation and the theoretical tumor seeding in the retroperitoneum is minimized due to occlusion with a balloon, then closure with a stapler. There are several disadvantages, including the need to perform fluoroscopy, with repositioning of the patient. Also, injury to the contralateral ureter can occur during stapling of the ipsilateral bladder cuff, because it is not visualized in an extravesical approach. Moreover, it is difficult to assess whether an adequate margin of the bladder cuff has been resected in an extravesical approach, and there is a potential of leaving viable urothelial tissue within the staple line. This tissue may not be visible during cystoscopic examination; thus it cannot be evaluated on follow-up. The theoretical risk of developing bladder stones is concerning, although this has not been shown to occur in the pig model (13) or in humans up to seven years (12).